Ashley and Dan had their wedding at a private residence. They had a rustic style wedding. Their engagement photos were done at Fort Niagara State Park in Youngstown, NY. That also had a rustic feel. For their wedding day photos, they wanted to change it up. They booked Shea's Performing Arts Center for photos! We love working here. It is so beautiful. 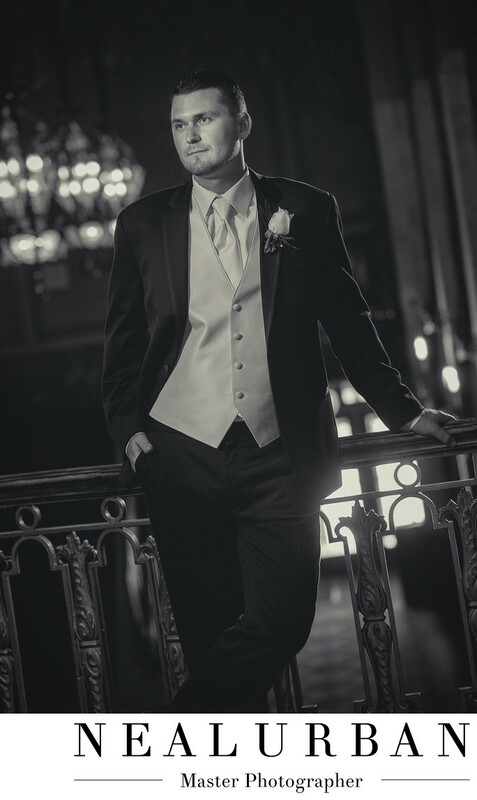 This groom is stunning! This is very GQ magazine! We loved his three piece suit! This was taken up on the second level. It overlooked the lobby. There are huge chandeliers everywhere inside Shea's. They are perfect for using in the back ground for photos. That is exactly what we did here for Dan. They were used to create a boca. It's a photography lighting effect. We needed some added light for the grooms face. It is pretty dark inside of Shea's. We gave Dan a cool, casual, and manly pose. Then we had him look off. He was actually looking at his beautiful wife Ashley. He had such a huge smile on his face. But we wanted one serious look to match the style of this image. It was so hard for him. We needed to move Ashley out of view! Once we got this, we brought in his lovely wife and it was all smiles for both of them! Location: 646 Main St. Buffalo, NY 14202 United States.